I have been thinking of writing this review for quite some time now but somehow never got the time… Ahh the time… seems like the most valuable thing now… In the rat race of life I am losing out on time. I wish sometimes the clock should just stop. Am I talking non-sense?? May be… let’s get into the The Price you Pay. As you all know given a choice I will most likely pick up a thriller book and that’s exactly what I did when I got an offer from Indiblogger & Harper Collins on a book review program. 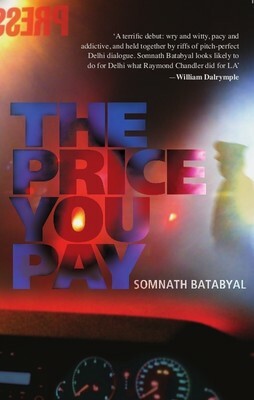 And since I could choose only one book I chose to go with this thriller by Somnath Batabyal. The snippets looked quite promising – so let’s see finally how it is. Fresh out of college Abhishek Dutta joins Express as a trainee reporter in crime beat in Delhi. Luck strikes quite early for him when he is able to uncover few scoops and gain the attention of his immediate boss Amir Akhtar, the big shot in Journalism world, and his competitors. Abhishek manages to make some allies in the Delhi Police department and he gets his hand on some of the breaking news. The rookie journalist overhears a conversation between Uday Kumar the supercop DCP Delhi Police and his subordinate Mayank Kumar on an eminent return of the dreaded gangster Babloo Shanker. Various twists and turns bring Abhishek in limelight and is offered a job of investigative journalist in the leading English news television channel. At a time when Delhi Police Department is going haywire in locating the dreaded gangster and bust his plans, Babloo Shanker contacts Abhishek and makes him his sole communication point to the world media. What happens to the kidnapping plan? What happens to Abhishek in these murky worlds of crime? Does he pay a price for all the attention he garnered? You gotta read the book to unravel the answers. I found the characters extremely well thought through. The emotions and anxiousness of a newbie in the journalism world is expressed well. Uday Kumar the DCP has shades of gray and that comes out nice. Narration wise it is okay, racy at times but dips and places as well. Having interned as a journalist (surprisingly at Indian Express only!) I could feel the emotions of Abhishek on his first day, or times when he is on his own to get a story. The book almost took me back to those times when I was interning and getting accustomed to the grinds of the journalism world. Being a journalist himself Somnath Batabyal obviously didn’t keep short of jargons and incidents from current situations in the country. Be it the black money or the commonwealth scam. And it is always good to find these told through humor – if you can read between the lines. Somnath Batabyal has been a journalist for over a decade and specializes in crime reporting – that explains the theme and plot of the story. This is his first attempt at writing fiction and he does a good job. To read more about him you can visit his website which also has a list of his other non-fiction works. I got a free copy of this book thanks to Indiblogger and Harper Collins. This review is written for Indiblogger.